Where did Edouard Manet grow up? Edouard Manet grew up in a wealthy family in Paris, France. He was born in Paris on January 23, 1832. His father wanted Edouard to become a lawyer, but he had no interest in the law and only wanted to work at being an artist. Edouard finally agreed to join the Navy as a compromise, but he soon left the Navy as a failure. When he turned eighteen, Edouard began to study art under the teaching of painter Thomas Couture. Over the next few years he also traveled to places like Florence, Rome, the Netherlands and Germany to study classical works of art. Part of his training was to copy the works of the masters. Coming from a wealthy family, Edouard didn't have to struggle to pay the bills like many of his fellow young artists. He often helped his friends out and was generous with his money. Manet began his career painting in the style of realism. He wanted to be accepted by the Salon. This was the official art exhibition of France. 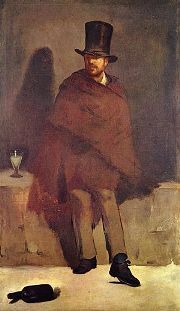 He submitted the painting The Absinthe Drinker to the Salon, but was rejected. The painting was very different from what the conservative critics of the Salon expected from artists. It wasn't a grand scene of historical importance, but an everyday scene of a poor man drinking. Later, another of his paintings called The Luncheon on the Grass, was again rejected by the Salon. Many people were upset and outraged by this painting. Manet became depressed over the rejections. He wanted to experiment and explore new styles of painting, but he also wanted to be accepted by the conservative Salon. Manet's style was to paint everyday people doing everyday activities. He took his inspiration from the streets of Paris. He painted beggars, singers, businessmen, and common people. He also used bold colors and broad brush strokes. His style took many people by surprise. Manet became friends with a number of new artists called Impressionists including Claude Monet and Edgar Degas. Manet's paintings continued to become more impressionistic in style. He began painting outdoors and experimenting with light and different colors. Many of the Impressionist artists started their own exhibition apart from the Salon. 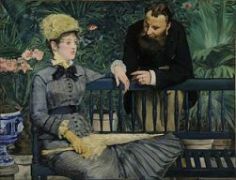 Manet, however, still craved the approval of the traditional French art critics. Finally, in the 1870s, Manet's paintings began to receive critical acclaim. He had several paintings accepted by the Salon and even received a medal from the Salon in 1881. 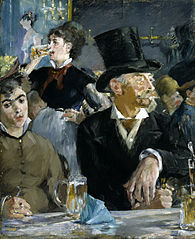 Manet enjoyed painting scenes from the cafes in Paris. He painted people doing a variety of things including drinking, just hanging around, dancing, and even reading. Edouard Manet finally gained the critical acclaim he so craved near the end of his life. Today he is considered as one of the great French artists. He bridged the gap between Realism and Impressionism paving the way for a new style of art. Some art historians consider Manet to be one of the founding fathers of Modern Art. He kept the love of his life secret from his father and then married her after his father died. He once challenged a man who wrote an insulting article about him to a dual. He painted around 420 paintings. He once said that "insults are pouring down on me thick as hail". Near the end of his life, his left leg became infected and had to be amputated. 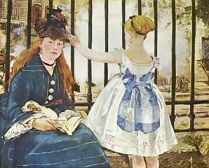 As a child, Manet loved to go to the Louvre museum and admire the art.